Image July 1919 Suffolk Chronical & Mercury newspaper. 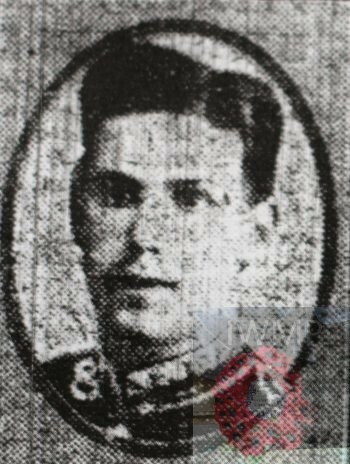 Died: 30th November 1917; age 30; Died of Wounds – 44 Casualty Clearing Station. Rank: Gunner; Service Number: L/41996. Regiment: Royal Field Artillery, ‘A’ Battery, 26th Brigade. Relatives Notified & Address: Son of George Cobbold; husband of Alice Elizabeth Cobbold, of 45, Tanner’s Lane, Ipswich. Brother to JAMES EDWARD COBBOLD. 1891 ‘Long Lane’ In Yard, Ipswich. George was 4 years old and living with his paternal grandparents, aunt & uncle. He was recorded as George Tye. George Cobbold, 52, a Tobacco Pipe Maker, born Stowupland, Suffolk. Mary A. Cobbold, 51, born Ipswich. James Cobbold, 16, a Canvas Sack Maker, born Ipswich. Eliza Cobbold, 14, born Ipswich. 1901 29, Gibson Street, Ipswich. George was 14 years old, an Errand Boy. He was living with his parents & siblings. He was recorded as George Cobbold. George William Cobbold, 36, an Iron Foundry Labourer, born Ipswich. Ellen Jane Cobbold (nee Tye), 33, born Ipswich. John William Cobbold, 12, born Ipswich. Ethel Maud Cobbold, 10, born Ipswich. Ellen May Cobbold, 5, born Ipswich. Arthur Joseph Cobbold, 10 months, born Ipswich. 1911 14, Handford Cut, Ipswich. George was 24 years old, an Iron Moulder – Foundry. He was married and Head of the Household. George’s mother, Ellen Jane Cobbold died 1907, Ipswich. Beatrice Ellen Cobbold, born 1909, Ipswich. George is also remembered at The Mission Free Church Ipswich Curriers Lane and the Orwell Works Memorial Ransomes Sims & Jefferies Ipswich.